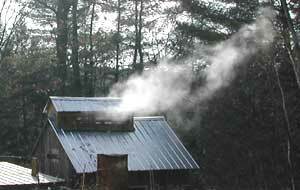 Later in the day we went for another walk and found two more syrup production centers under full steam. The one above didn't seem occupied, but the folks at the next operation were really pleasant and let me snoop around. 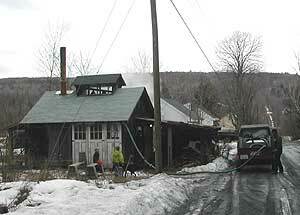 No central pipe here, at least not one that runs to the shack. An electric pump in the trailer transfers the newly collected sap into large holding vat around back. Meanwhile the kids pitch in and help transfer wood indoors.